An essential part of camping is making sure you have water to drink. But some people might also want tea in the afternoon and coffee in the morning. That’s when you need a kettle to boil water, safely and quickly. 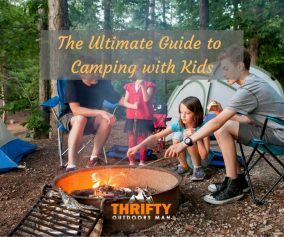 Luckily, there are two camping kettles—the Ghillie Kettle and the Kelly Kettle—that do the trick. These kettles, while essentially very similar in design, both use a small stove to heat the water inside the container instead of requiring a campfire. However, these two kettles do have some differences, so we’ve set them up for a comparison to help you decide which one is the best for you! The Kelly Kettle originated in the 1890s in a small fishing town of Ireland by a man named Patrick Kelly, who was the great grandfather of the current Co. Directors of the company. By the 1950s, the Kelly Kettle had grown in popularity throughout Ireland. Fisherman especially enjoyed the kettle because they could produce boiling water on extremely windy days. As demand for the kettles grew, the family decided it was time to diversify the designs, create different sizes, and start spreading their kettle internationally. As of 2017, you can buy a Green Whistle to replace the Orange Stopper. However, this has yet become standard. Handcrafted in the UK, the Ghillie Kettle has featured the same design and materials for well over a century. The original is thought to have been the “Thermette,” crafted by a man named John Ashley Hart in 1926 after getting inspired by Chinese and Mongolian hotpots. Then in 1928, the George Marris & Co. of Birmingham met with Hart to create the Sirram Volcano Kettle. The the company and designs were sold in the 60s, the Sirram Volcano design didn’t need any improving upon, and so it is still manufactured today, but just as the Ghillie Kettle. Though the design compares closely to the Kelly Kettle, a single unique feature on the Ghillie Kettle would be the built-in whistle. Both the Ghillie Kettle and the Kelly Kettle are of the “Irish volcano kettle” design, and they are known to belch fire from the shoot at the top of the kettle. At the bottom of both kettles, you will find a stove area that can be filled with pine needles, leaves, and anything else that will burn. From there, the heat works to boil the water inside of the kettle that sits atop the stove. 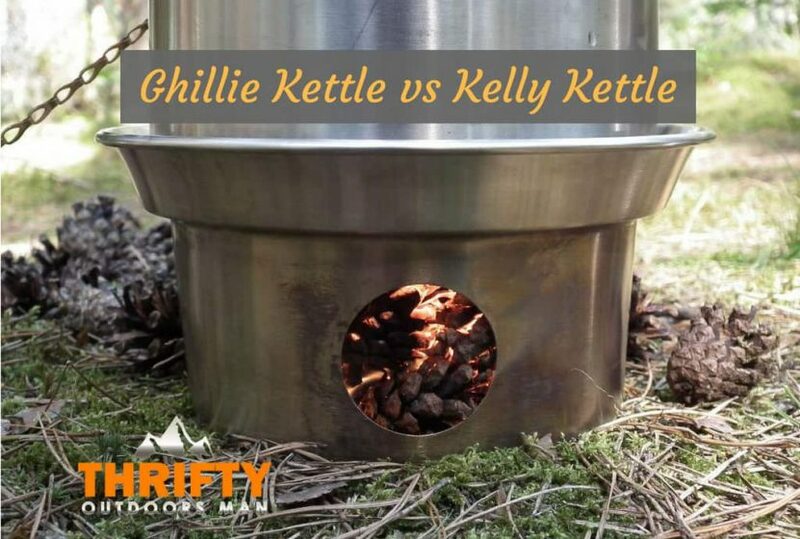 Depending on the size of the kettle and amount of fuel you added to the fire, both the Kelly Kettle and Ghillie Kettle can have water boiling for tea or coffee in as little as 3-5 minutes. Both kettles are exceptionally well made. That said, the Ghillie Kettle is made of aluminum, but in order to increase both strength and durability, this material can be anodized. This also makes the kettle corrosion-resistant. On the other hand, you can choose between stainless steel or aluminum with the Kelly Kettle. Aluminum is undeniably lighter, but the steel option is way more durable (and heavy). Both kettles come with wooden handles for easy pouring—but as with any kettle, be careful when grasping the handle, since it’ll be hot. Both kettles have different sizing options, and those options are all just a bit too large for taking on long hiking trips. 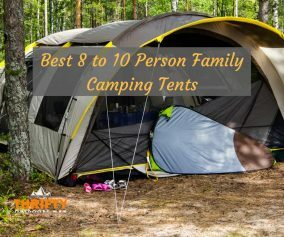 However, if you plan on car camping, kayaking, fishing, or just setting up camp for a few days, the size won’t be a deterrent. Base Camp – traditional kettle with a height of 34cm/13in (diameter 18.5cm/7.3in), 1.6 liter capacity or about 5 mugs of water. Scout – mid-sized kettle standing at 27cm/11in (diameter 18.5cm/7.3in), 1.2 liter capacity or 3.5 mugs of water. Trekker – small-sized kettle with a height of 27cm/10.6in (diameter 14cm/5.5in) at 0.6 liter capacity (2 mugs). Thin design. Adventurer – Holds up to 1.42 liters (about 4 mugs of water), has a height of 34cm/13in, and a width of 18.5cm/7.3in. Explorer – Holds up to 1.0 liters (3 cups), has a height of 28cm/11in, and width of 18.5cm/7.3in at widest point. Maverick – Holds up to 0.5 liters (2 mugs), has a height of 27cm/10.6in, and a width of 14cm/5.5in. Though the Kelly Kettle is slightly larger in size, the difference only produces maybe a half cup more of boiled water. Oddly, though the Kelly Kettle is larger in size than the Ghillie Kettle, it is actually slightly lighter than its opponent. Note that the weight of aluminum and anodized models has a very insignificant difference. 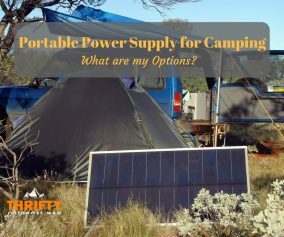 If you are concerned about the ounces of your gear and are trying to make your backpack as light as possible, the Kelly Kettle could be the better choice. Though the weight difference is slim, that half a pound can make a perceptible difference. Depending on how you want to carry your kettle around, the design of the carrying bags could be a decisive factor. Ghillie Kettles come with a drawstring sack that can convert into a backpack. Conversely, the Kelly bag has a single drawstring. However, the latter also has a cinch to keep it closed tightly. Both bags are designed to also hold any accessories you purchase or receive in a set. Kelly Kettles have a couple of set options, like the stainless steel cooking set which has a grill, pot, lid, and a handle. Also available are hobo stoves, pot supports, metal plates, and stacking mugs with lip protectors to keep you from getting burned. Ghillie Kettle also comes with options like a triangular pot to supporting cooking on uneven ground. 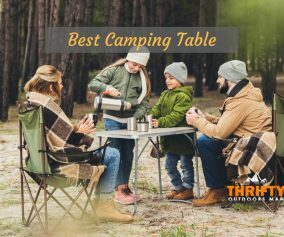 You can also purchase handle grippers, grills, and anodized pots and pans to make your camping experience even better. While there aren’t any major differences in the Kelly Kettle and Ghillie Kettle, both of the volcano style kettles work extremely well, boil water within mere minutes, and ensuring you stay hydrated. When it comes to deciding, if you’re looking for more cups of tea or coffee, the Kelly Kettle is a good pick; and if you’re opting for smaller, more packable kettles, the Ghillie Kettle is ideal. Aluminum or stainless steel, either kettle is a useful tool.